Workers at a Tennessee automobile plant rejected the United Auto Workers union’s bid to break into the right-to-work state on Friday. The plant rejected the UAW’s attempt to unionize the plant 712 to 626, despite an aggressive campaign by the labor group and the cooperation of Volkswagen. Union opponents, including Matt Patterson, executive director of the Center for Worker Freedom, celebrated the historic vote. The rejection of a key Democratic Party ally occurred despite President Barack Obama's personal support for the unionization drive. Tennessee Republicans "are more concerned about German shareholders than American workers," Obama said shortly before American workers shot down the unionization bid, according to the Detroit Free Press. "The workers at Volkswagen looked at the history of this union and made the best decision for themselves, their jobs and their community," Patterson said in a statement. "In spite of the UAW's multi-million dollar propaganda machine, and with company and government officials at Obama's NLRB aiding the union in every possible way, workers learned the facts and were able to make an informed decision." 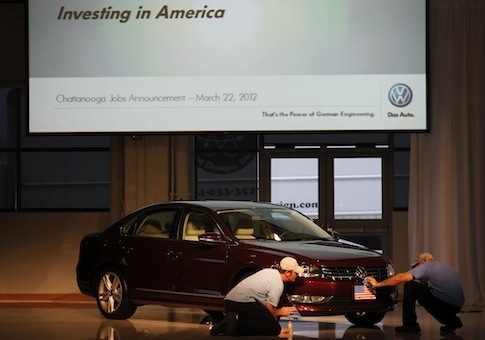 Union organizers and other supporters were granted access to the plant in the weeks leading up to the election, while VW rejected a petition from employees to allow union opponents to present their case. John Raudabaugh, a former member of the National Labor Relations Board, said that he had never seen a company work so closely to aid a union election. "They provided onsite offices for the union before the union was even the official legal representation for the workers," he said. Volkswagen had been calling on the American plant to form a works council, a cooperative unit that gives workers a direct line to management to discuss issues such as worker safety. While such entities are common in VW’s native Germany, this was the first time that it had attempted to impose one in the United States. "The union said that they would do everything they could to keep VW competitive in the marketplace—another way of saying, ‘we’re not going to increase your direct labor cost. So they were already selling the workers out," Raudabaugh said. He added that a victory would have provided a "lifeline" to the UAW, which has hemorrhaged members in recent years with the decrease of manufacturing in Detroit and the auto industry’s move to southern states that do not require unionization. The union had hoped that winning at the VW plant would have a domino effect, allowing them to organize other major auto factories in the region. Mark Mix, president of the Right to Work Foundation, hailed the workers for resisting those attempts. "Despite all of this, UAW union officials still lost the vote. If UAW union officials cannot win when the odds are so stacked in their favor, perhaps they should reevaluate the product they are selling to workers," he said. This entry was posted in Issues and tagged Right to Work, UAW. Bookmark the permalink.